Sometimes I stress about the state of our house, it’s a mess, truth be told. There’s usually newspaper strewn about, because the housepigs love to tear it up. The floors are dirty, because we are constantly in and out of the house in our Wellies, and the pigs dirty hoovies leave tracks the minute I try to clean the floor. There’s usually puddles on the kitchen counters from all the bowl washing and water jug filling. Stannie likes to root up the carpet where two pieces join, and lie on the floor beneath. There’s usually hay tracked in somewhere. The only thing you will never find on our floors is a kernel of pig chow, dog kibble or cat food. With pigs, not a morsel is safe from their sensitive snouties. It’s just not a priority for me to keep the house spotless. It’s more important that the barns are clean. I sweep the floor more often in the little barn than I do the house. I fret about the cobwebs in the barn more than I do the ones in the house. Sometimes I go into panic mode when we are expecting company, but then I figure, hey, anyone who knows us knows that the pigs are the most important thing, and if they can’t deal with a messy house, then they generally just don’t come back. Someday we’ll have all the stalls, yards and pastures just the way we want them, and I might have time to concentrate on beautifying our living space. Until then, you’ll sooner see me with a broom in the barn than in the house, and there it is. Our boarder, Pugsley arrived a week ago today. He’s a lovely pig, due to the fact that he was raised with love. His human Mom is truly a kindred spirit, she even has the same name as me! First and last! She understands pigs the way only a true pig person does. Pugsley seems to be enjoying life here. The nests he builds with his hay and blankies from home are phenomenal. His Mom was concerned that Pugs would miss his special meals that she always prepared for him, pig chow, kernel corn and potatoes. Well, the potatoes are a little much when we are feeding 18 pigs, but it’s so easy to just open a can of corn and pour it on his chow, at least he still gets that, and always will. He brought his radio from home, and although we can’t seem to tune in any classical music, (his favorite) he seems to be enjoying the same rock station we listen to. No hard stuff, just the ballad-y type stuff. He has his bowls from home, and his blankets, and he seems to love the pig yard. I’m hoping that he can be friends with Rebel and Domino in the near future, then he will have all that I wish for him, except his human Mom. But I’m confident he will be reunited with her someday. In the meantime, I will do all I can to be his replacement Mom. Little Wuzzle is just so amazing. He is an important part of the bigpig herd. I was letting him back into his old pen at mealtimes, until the piglet pack moved into it, because I was afraid he was too small to withstand the frenzy and stampede at meal time. I needn’t have worried. He runs to the far end of the barn where the first bowl is hurriedly placed by Bob, takes a quick mouthful from under Queen Dee-Dee’s nose, follows to the next bowl, takes a bite, and so on till the last bowl is placed, and that one is the one for him. He does the musical bowls game like a pro, running for the unattended bowl the second Willa, Rosie or Delilah oust him from his. Harry does not oust anyone, and will even leave his bowl should Wuzzle demand it. Sweet Harry. I am looking forward to the day Doc joins this herd. Somewhat. 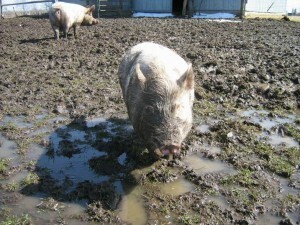 I’m worried about him, but I want him to be among pigs his own size, and to have the large pasture to run and play in. It’ll be sad to separate the three Musketeers, the piglet pack, and I’ll miss seeing Doc and Storm lying side by side, with little Truly smushed in the middle. They’re like an oreo cookie in reverse. Truly is the chocolate in the middle.